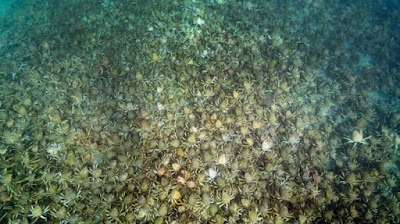 A horde of giant spider crabs has amassed in waters near Melbourne, Australia. 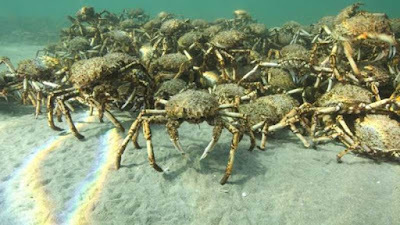 Hundreds of thousands of the crabs migrate to Australia's southern shores each year as ocean waters cool. Australian aquatic scientist Sheree Marris filmed an enormous gathering of the crustaceans in Port Phillip Bay. Ms Marris said she hoped to raise awareness of the diversity of sea life in Australia's southern waters. "Who would have thought something like this, that is so spectacular, could be happening in Australia on the southern shore," she said. The exact reason for the behaviour is not known, but scientists speculate it is most likely to do with the process of moulting. When crabs shed their hard outer shell in order to grow, they are vulnerable to predators such as cormorants and stingrays. Bunching together in large numbers provides a level of protection against being eaten. "People think Port Phillip Bay's a marine wasteland … but this is really unique and it's really spectacular," Ms Marris said. "Not only is [Melbourne] the most liveable city above the water, it is also the most liveable below the water."